I have chosen this book because I really enjoyed it. It was about a boy whose parents are famous scientists but his mum dies so he makes a machine that takes him to different worlds to find one where his mum is alive. This story is one that will bring the reader through many emotions: happy ones, sad ones and many others. In the first world that Albie visits he meets a bad version of himself who forces him to take his place at school. It turns out that the day he goes to bad Albie’s school, he finds out that Victoria, the girl who is mean to him in his own world is bad Albie’s girlfriend. He goes to a science museum and a boy, called Geoffrey, makes him steal a stuffed platypus. The consequences of this was that Albie was expelled and bad Albie tries to beat him up. Albie climbs back into his machine and is whisked off to another world. In the second world, he meets a girl version of himself called Alba who is disabled and her mum died in a car crash. Together, they go to Victoria’s party and Albie helps Alba to dance in her wheelchair. They discuss the machine and then discover that her grandpa has accidentally broken his machine and they have to fix it. In the third world, Albie meets his dad when they are struggling with keeping electricity and soon the entire world will be black. Together they make a machine which restores electricity but unfortunately Albie’s mum does not live in this world. The next morning, Albie has to flee this house because the real Albie in this world is coming home. He also discovers that this world has two moons. 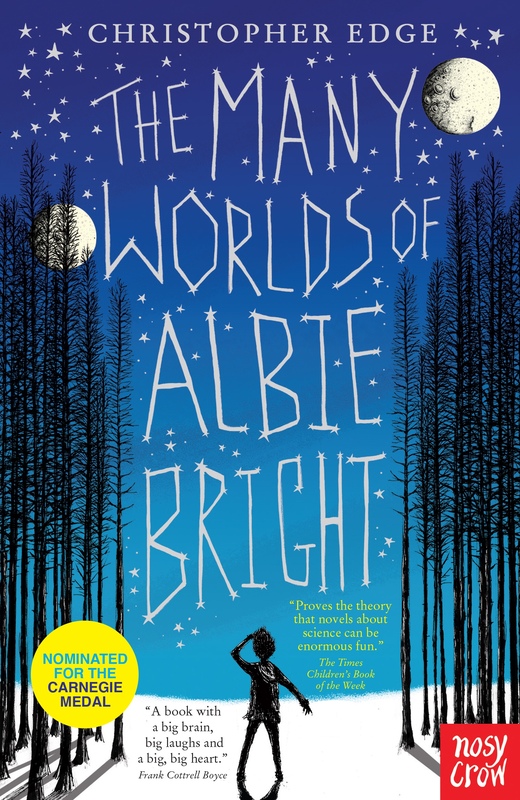 In the final world that Albie visits, he finds out that the baby version of himself did not survive and his mum is now pregnant with a little girl. Albie explains to his mum that he is from an alternate universe and has been using her old laptop to get around different worlds. Sharing one final hug, Albie says goodbye to his mum and returns home to his world. In time, for his school fair, he gets his mum’s ashes in a mug, hooks them to a balloon and sends them into space. That is when the final words are spoken: ‘when I look up there into the heavens I know mum will always be there’. It was such a lovely ending, I cried. I think this book would be good for children who enjoy science fiction. I rate this book five gold stars.